Wikipedia has Sexton, Iowa listed as a ghost town with an old grain elevator remaining. That is odd because I remember not just the grain elevator but also a handful of houses. I also remember stopping by a roadhouse named Racers with a giant menu and wall-to-wall racing decorations. Location: 1826 Highway 18 in Sexton, unincorporated township outside Algona in Kossuth County, Northern Iowa. Directions: Its in "downtown Sexton" which means the one cross street along Highway 18 between Algona and Britt. 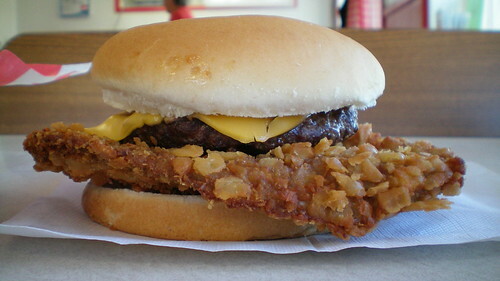 The Tenderloin: Exceptionally thick and juicy, barely tenderized meat to chew through slowly. The trim job left some bits of fat out inside. The outside is a thin batter with deep amounts of black pepper and spices. The battered tenderloins have a way of locking in juices and this one is no exception. Served on a toasted bun. Overall 7.8 out of ten. Also on the menu: The menu is big with all the usual fried stuff and bar fare. They also bake Stone Willy brand pizzas. There are a bunch of things with intentional misspellings like Wingz and the creatively titled RUEBENZ BALLZ appetizer. Service: Each of my visits has had one person running the bar and tables while another person cooks. Its just regular bar service. Ambiance: This is a racing bar with beer signs and racing posters covering the walls in every direction. The lights are dim, neon beer signs, and there are flatscreen televisions to watch. Final Thoughts: Its always nice to find something good to eat while driving through a small town. Its a good thing they had a sign reading Homemade Tenderloins, it makes my job easier when deciding where to stop.